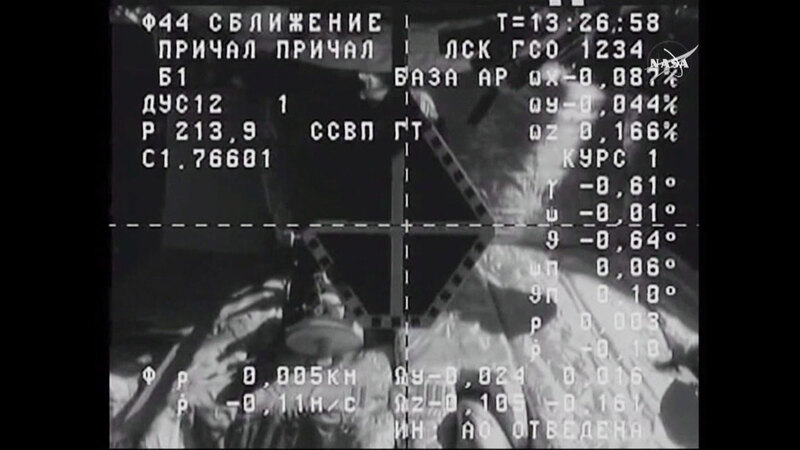 Engineering video from a camera on the Progress 62 spacecraft shows the docking target on the Pirs docking compartment. Traveling about 253 miles over western Mongolia, the unpiloted ISS Progress 62 Russian cargo ship docked automatically with the Pirs docking compartment of the International Space Station at 5:27 a.m. EST today. Progress is delivering 2.8 tons of food, fuel, and supplies to the crew aboard the station. The spacecraft launched Monday from the Baikonur Cosmodrome in Kazakhstan. Following a by-the-book rendezvous and docking with the Progress’ upgraded Kurs automated system, hooks formed a hard mate between the spacecraft and the Pirs docking compartment. Once the crew completes leak checks, the hatches will open, allowing the crew to unload the cargo. The Progress spacecraft will remain docked until early July 2016. For more information about the International Space Station, visit: https://www.nasa.gov/station. I have pleasure in sending you my sincere congratulations on forthcoming holidays and wish you health and successful return to the Earth. As I wrote before the two main things are important for the Crew of ISS, viz. COMFORT AND SAFETY. I am pleased to get to know that a representative from the UK joined the Crew this time. The matter is also the fact that I would like to recommend to keep strongly whole your health up there by making use of portable InfraTapp Hand Held Massager(s) with massage varieties viz. INFRARED HEATING, TAPPING, AND VIBRATION which activate the lymphating system, the blood circulation, help to relax and other wellness. It would be better to deliver Massagers to you for each member of the Crew. Weight 1,3 kg. Made by “Welness System World LLP”, England, Cornwall Building, 45-51 Newhall Str,, Birmingham. I have been proceeding on doing publicity campaign related to ISS and other themes of exploring Cosmos. I take part in Social Networks: Facebook, Twitter, Google, Linked In, Mail.ru, VK, OK and others. Congratulations for the successful arrival of the Progress 62 cargo vehicle, A great Christmas Present for the Crew. Merry Christmas to all the ISS Team! Congratulations, international space station on your resupply mission today . Glad to read things are going well up there. Hope you enjoy a happy holiday season in Earth orbit. Congratulations for docking success ! Happy merry Christmas to you all! Happy Holidays to you, Crew! As NASA notifies me when you are visible from my location in Georgia (USA), I often see you traverse the sky in that steady, comforting trajectory. Sometimes I can’t abstain from waving…. Champagne is most likely not on your menu, but when I indulge, I will think a toast to you and wish you a wonderful, exciting and healthy 2016! Merry Christmas from the UK! Did ISS view the re entry of the SL-4 rocket body on Dec 23 @ 18:00 PST when passing over So California? Both were in view at the same time from Victirville, Ca. MERRY XMASS AND PROSPERIOUS NEW YEAR,LONG LIVE THE CREW ON ISS. God Bless you and have a safe journey home.